An overall fat-loss program requires self-discipline and hard work, as well as changes to your diet, aerobic exercise and strength training. Your diet must be nutrient-dense and low in calories to lose weight the healthy way. An exercise regimen that includes aerobic workouts to burn calories and body fat, along with strength training to improve your metabolism at rest, is also required. There is not a single best method, but several actions can work in combination with one another to help you lose overall body fat. Consume a healthy diet that promotes body-fat loss. This includes eating foods that have essential vitamins and minerals and few calories. Foods like fish, chicken, nuts, low-fat yogurt, sunflower seeds and multigrain breads help you remain full and provide your body with adequate nutrition. Avoid processed foods like canned veggies and meats, or frozen meals that contain preservatives. Realize that the frequency with which you consume meals is just as important as the kind of foods you eat. Do not eat on a traditional, three-meals-a-day plan. Instead, eat smaller portions every couple of hours throughout the day. This prevents your blood glucose levels from dipping, which can occur after long periods of time without food. Perform aerobic exercise at least 30 to 45 minutes daily, most days out of the week. Try exercising in the morning before you eat breakfast, so that your body uses fat stores to fuel your workout. 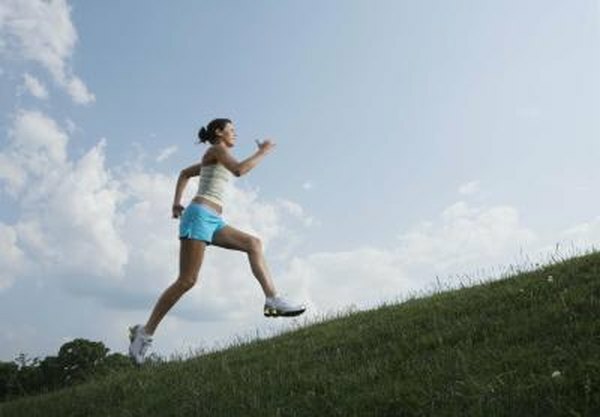 If possible, work out throughout the day to keep your metabolism revved up. You can do 20 minutes of cardio in the morning and 20 in the evening, or 15 in the morning, 15 in the afternoon and 15 in the evening. Use strength training to improve your resting metabolic rate. This enhances lean muscle mass, and since muscle is more effective at burning calories than fat, the more you have, the more body fat you will lose. Perform two or three full-body strength training workouts per week. This allows you to sufficiently build muscle while allowing them to rest and repair for the next workout. Consult your doctor before starting a new exercise routine or diet, especially if you have an injury or health condition.